Saturday October 30, 2010 Halloween EVE! This is the historic Universal Furniture Building at the intersection of St. Claude and St. Roch in the Bywater neighbordhood. Anba Dlo III: Apology to the Waters, 2010 is a 21+ costume event, featuring free drinks, a costume parade and contest, outdoor live music stage, DJ, a Trance/Spiritual music room presented by Wild Lotus Yoga, fire dancers and acrobats and the Terrence Sanders Private Collection Art Exhibit, a live auction, along with many other activities. Anba Dlo is Kreyol for "From Beneath the Waters." It refers to the realm of departed souls. The time of year around All Hallows Eve, the day of remembrance for the departed, is a time to call these souls forth. In New Orleans, this name has special resonance; our city has been called up from Under the Waters to rise, rebuild and heal. All information is subject to change; as we approach the event, the list of activities continues to evolve, so be sure to check back often! 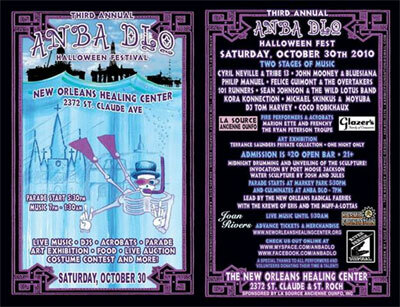 The New Orleans Hope and Heritage Project and The New Orleans Healing Center are pleased to announce the date for The Second Annual Anba Dlo Festival. This year’s event, Apology to the Waters 2010, will be held on Halloween Eve, Friday, October 30 from 5:00 pm to 4:00 am at 2372 St Claude Avenue in the Bywater. Waterline 2009 is a 21+ costume event, featuring free drinks, a costume parade and contest, outdoor live music stage, DJs and a dance floor, Trance/Spiritual music room, fire dancers and acrobats and a Faculty Art exhibit, along with many other activities. An interactive community festival, Anba Dlo celebrates the multicultural and artistic heritage of New Orleans through such mediums as sculpture, visual art, body painting, crafts, music, dance, acrobatics and costume. Anba Dlo's main event will take place in the 55,000 sq. ft. historic building which is home to The New Orleans Healing Center, a multidisciplinary community revitalization project located in the heart of the burgeoning St Claude Ave. Arts District. All activities of Anba Dlo are centered on an onsite water sculpture created from Katrina debris and assembled by local artists and community members. This interactive artwork will be unveiled at midnight during the Anba Dlo event as a personal community mandala combining sculpture, craft, tribal dance, fire, sound and light. The completed sculpture will then continue to be displayed in the central lobby of the Healing Center until the following year. Admission for the event is $15. Advance tickets will be available September 20, 2010, at www.neworleanshealingcenter.org, along with commemorative t-shirts, posters and raffle tickets. In addition to the costume party, Anba Dlo will also feature a costume parade and the Faculty Collective Art exhibit. The parade, starts at 6:30 pm at Markey Park. Everyone is invited to join the parade, led by The Radical Faeries, as it makes its way through the festive streets of New Orleans to the New Orleans Healing Center. Make sure you dress for the party (water-themed costumes such as mermaids and other ocean creatures are suggested) and prepare to celebrate Halloween “Nawlins” style! The Faculty Collective Art exhibition, featuring the work of 50 local university art faculty members, celebrates the remarkable art teaching faculties at the universities and colleges of New Orleans. The unfolding efflorescence of art in the city, especially over the last decade, is the glorious result of the vision, intelligence and teaching skills of these creative and committed artists. The New Orleans Healing Center is honored to bring together, for the first time, an exhibition of the work of all the city's art faculties. The show opens on Halloween Eve, as part of the Anba Dlo Festival. The Faculty Collective Art exhibition will officially open on October 30 runs through December 12. You have been wrongfully accused of murder, now you must endure the horrors of the New Orleans Parish Prison in the first-ever "Jail House of Horrors ," an interactive Halloween horror house. Produced by Big Easy Award-nominated actor and director Frederick Mead, in conjunction with event planner Clay Thomas, "Jail House of Horrors " is scary fun for the whole family . The “Jail House of Horrors” is open every weekend in October and Wednesday through Thursday nights Halloween week. A portion of all ticket sales benefits the New Orleans Healing Center , New Orleans Radical Faeries and New Orleans Police Foundation . The Second Annual Anba Dlo Festival is sponsored by La Source Ancienne Ounfo, Inc. and The New Orleans Hope and Heritage Project, a 501(c) 3 organization. The New Orleans Hope and Heritage Project is dedicated to supporting the efforts to rebuild and transform the city of New Orleans, with an emphasis on environmentally aware, socially conscious urban planning while staying true to the unique heritage and culture of New Orleans. Housed in the Universal Furniture Building, the Healing Center is a multi-use space that will provide community-oriented services, products, and programs including an organic grocery store, sustainable food garden, internet café and juice bar, alternative healing offices, street university, retail bazaar, art therapy and galleries, performance space, child care, Woman’s Infants and Children program, environmental office, woman’s center and spiritual space. The New Orleans Healing Center is scheduled to open in the Fall of 2010. The goals of the New Orleans Healing Center are to heal on every level of sustainability; to catalyze the revitalization of downtown New Orleans and to unify polarized communities. The Center will provide products, services and programs created to bring healing to the individual, the community, the region and the world. It will serve as a catalyst for the revitalization of 7 neighborhoods on both sides of the Downtown Rampart/St Claude corridor, occupying the 3-1/2 mile historic stretch along the Mississippi, known as Downtown New Orleans. "We can create from these polarized neighborhoods, one cohesive and balanced community,” says Sallie Ann Glassman, a founder of the New Orleans Healing Center, "Diversity is strength wherever it is encountered." The 2nd Annual Anba Dlo is presented by the New Orleans Hope and Heritage Project and is a collaboration of the Departments of The New Orleans Healing Center, including Wild Lotus Yoga, The New Orleans Food Coop, Nola Solar, The Arts and Crafts Bazaar, The Retail Boutiques, The Performance Hall/Community Space/Theater in the Round, The Healing Arts Center, The Full Circle Women's Collective, the Street University, The 5th District Police Precinct, health food restaurant, hydroponic garden, Spiritual Center, childcare, together with the local Radical Faeries, the 50 artists of The Faculty Collective Art Exhibit,100 local musicians, acrobats, dancers, 100 volunteers, local chefs, local crafts persons, local business people, filmmakers, writers, and La Source Ancienne Ounfo, Inc, a 501(c)3 public charity. The 2nd Annual Anba Dlo is sponsored by Abita Beer, Glazer's Family of Companies, The French Market Foundation, New Orleans Musicians Clinic, River Parish Disposal, The New Orleans Jazz and Heritage Festival and Foundation, Karmic Foundation, La Source Ancienne Ounfo, Marlin N. Gusman, and the Criminal Sheriff's Office. For more information, visit www.neworleanshealingcenter.org.